We were turned on to Rose-Hip Vital® Canine by Canine Naturopath Lyndall Pinchen who couldn't speak highly enough of it's joint healing properties. 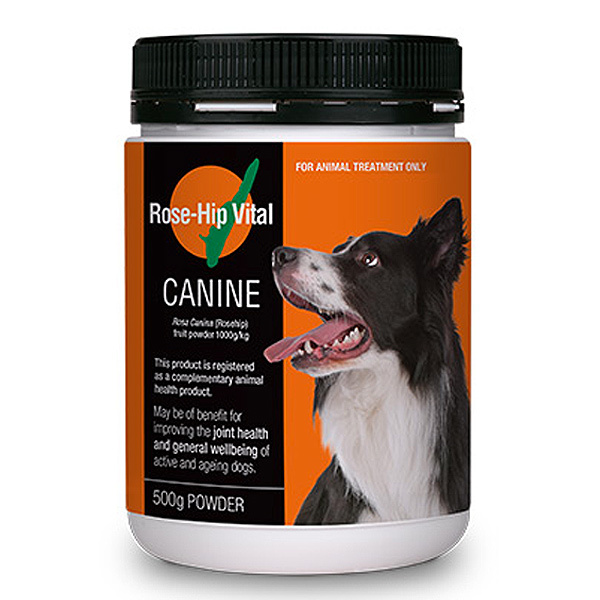 Rose-Hip Vital® Canine is a 100% natural supplement that can help improve your dog's joint health and general well-being. It can be used to treat both active and ageing dogs. It is a powerful antioxidant and antii-imflammatory and a fantastic source of vitamin C. Rose-Hip Vital is safe, scientifically proven and registered by the Australian Pesticides and Veterinary Medicines Authority (APVMA). What makes Rose-Hip Vital Canine powerful is the unique healing compound which is activated during the patented drying process of the Rosehip fruit. PHYTOMEDICINE 2010 – Rosehip has been the subject of a significant new study published in the of medical journal Phytomedicine – Rosehip herbal remedy in patients with Rheumatoid Arthritis – a randomised controlled trial – which has shown that patients with Rheumatoid Arthritis may benefit from additional treatment with Rosehip powder with Galactolipid (GOPO®). APLAR 2008 – a presentation by Joseph Schwager, Phd, at the APLAR conference Asia Pacific League of Associations for Rheumatology conference in Japan titled The Galactolipid GOPO® Mediates Beneficial Effects of Rose Hip on Arthritis by Reducing Chemokine and Interleukin Production in Macrophages and Chondrocytes, showed that an active compound, when isolated from the Rosehip, may play a role in assisting in the rebuilding and protection of cartilage. OARSI 2008 – A study released by Arasalan Kharazmi, Phd, at OARSI (Osteoarthritis Research Society International) – Laboratory and preclinical studies on the anti-inflammatory and anti-oxidant properties of rosehip powder – Identification and characterisation of the active component GOPO® – demonstrate through assessment of in vitro studies that rosehip powder exhibits anti-inflammatory as well as anti-oxidant activities. JOURNAL OF RHEUMATOLOGY 2005 – A trial published in the Scandinavian Journal of Rheumatology – A Powder made from seeds and shells of Rosehip Subspecies (Rosa Canina L) reduces the symptoms of Knee and Hip Osteoarthritis: a Randomised, Double-Blind, Placebo Controlled Trial – showed that 82% of patients reported a reduction in pain after 3 weeks of active treatment with GOPO®. Pain was alleviated to such an extent that 40% reduced their consumption of parecetamol1. Further evidence of the effectiveness of GOPO® on chronic joint conditions has been reported by the Phytomedicine Journal of 2004; 66% of patients taking GOPO® reported a reduction in joint pain. Interestingly, patients also reported an improvement in general wellbeing, including mood, sleep quality and energy. 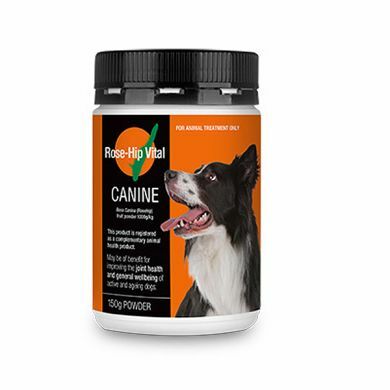 Read 1 customer review of Rose-Hip Vital Canine Powder. The average customer rating is 5. I mix this with yogurt and it must be ok as my pup will eat it all. Only just started using this product so I'm not sure if it has any health benefits yet but I'll keep using it.